Find articles from magazines, journals and newspapers, as well as streaming video and more. Start your research with a LibGuide created by an MCC Librarian! Back by popular demand! Pet therapy returns to MCC the week of May 5 to help alleviate the stress of preparing for finals. 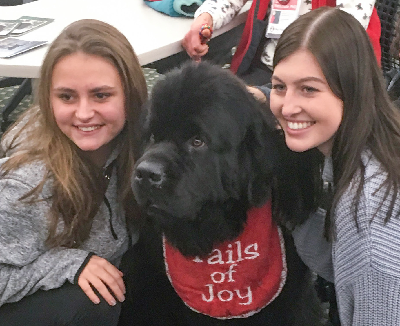 Therapy dogs and their humans will visit campus on Monday, May 6, 10 a.m.-12 p.m. in LRC A142); Tuesday, May 7, 1-2 p.m. in LRC A108; and Wednesday, May 8, 11 a.m.-1 p.m. in LRC A108 and A142. The visits are sponsored by the Raymond F. Damato Library, Disability Services and the Paralegal Association. Hours vary when courses are not in session and during intersession. See complete hours listing.